Peyton Manning is football royalty. 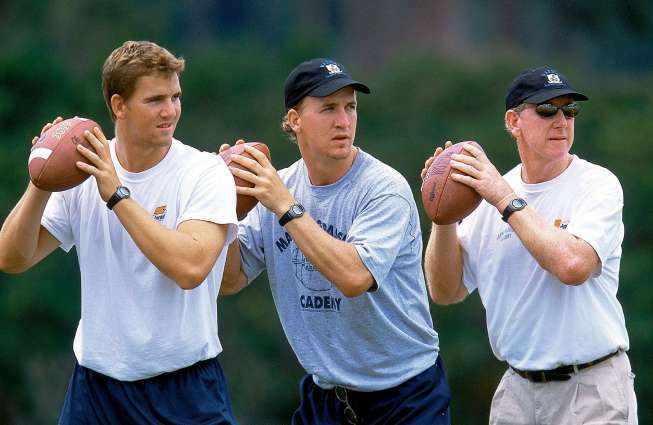 His father Archie Manning led the New Orleans Saints for years, and his younger brother Eli Manning has led the New York Giants to two Super Bowl victories. In his last Super Bowl, Super Bowl XLII appearance he won the Most Valuable Player award. Though Archie Manning never made it to the Super Bowl, he left his mark with the Vikings, Oilers and the Saints. Even the oldest brother, Cooper Manning, promised incredible talent in football before a medical condition ended his playing days. Now, despite four MVP awards and a 2007 Super Bowl XLI victory, Peyton may be hanging up the cleats and joining his oldest brother on the sidelines. Manning spent the 2011 season watching the Indianapolis Colts in a Colt’s sweatshirt while the rest of the team won the AFC South. Doctor’s operated on his neck keeping him off the field for the entire 2011 season. Two doctors with the NFL cleared Manning for the 2012 season although he is still healing from the operation and the nerves in his arm are not in the best condition. The Colts, especially Team Owner Jim Irsay, seemed doubtful of his return. Irsay and coaching staff commented that they would not cater to Manning just because of his talent and time on the team. However, Irsay said on the red carpet of the Maxim party in Indianapolis on Feb. 4, 2012 that he would welcome Manning back to Colts if he truly wanted to play and despite Stanford University’s Andrew Luck’s position in the NFL draft. Manning’s return relies on doctors that work specifically with the Indianapolis Colts program who still have not cleared Manning. The Colts may be welcome to accepting Manning again, but in the waiting period, people are talking. There is talk of Manning joining so many before him on-air. Manning has solid conversational skills and a lot of experience with the game to provide the analysis and quality talk. Manning charms the audience with a sense of humor. He participated in NBC’s “Saturday Night Live” and brought viewers more than a few laughs in a spoof of a United Way commercial. His father, however, indicated to “The Score,” an affiliate of the “Indiana Business Journal”, that he did not expect Manning to take that route. Others speculate that Manning might pursue a career coaching. “The Score” also reported that while those covering the Colts do not predict Manning to coach, his father thinks he might be up for it. Manning has a fantastic resume of skills. Sports gurus thought of Manning for the head coaching position of the Colts. The University of Tennessee grad was considered by analysts and fans when the Colts let Head Coach Jim Caldwell go. Manning has no experience in coaching to bring to the Colts, but has adequate talent as a quarterback to be a contender. Rumors put him in the race for the job at Ole Miss but that has been denied. I suspect that Manning will continue to play football for a few more years unless his worsens or does not heal. Whether or not he chooses to stick out his last years with the Colts, remains to be seen. I think after the confusion regarding whether or not he would be welcomed back to the team, Manning may be tempted to take his talents to the beaches of South Florida where he and his wife have a condo. I hope, however, that his professional legacy can continue where it began in Indianapolis with a $28 million bonus in March.